When I read cookbooks, there’s always something that sparks an idea and sends me toward the kitchen. Sometimes, though, I just really enjoy the book and don’t want to move from my chair until I’ve finished it. Eating Local falls into that very category. It's been a pleasure to read this book about using locally grown food and the stories about farmers from different parts of the US. The recipes are straightforward and familiar, but they all have an unexpected twist that makes them fresh and new. For instance, beets with goat cheese or feta is a natural combination. But here, cooked beet greens and stems are topped with whipped feta seasoned with Aleppo pepper and mint. There’s also a zucchini bread, but this one has grated carrots and minced candied ginger in it. There are grilled cauliflower steaks with tahini sauce that look great too. The many stunning photos and the little, surprising additions to the recipes kept me turning the pages to see what I’d find next. Throughout the book, there are introductions to farmers from Oregon, Massachusetts, Minnesota, Illinois, and even Austin, Texas, and the stories offer glimpses into what inspires these farmers to do what they do, their challenges, and their successes. I could go on and on, but I will just tell you one more thing about the book. It’s organized by ingredient alphabetically. You can look to the top right or left corner of each page and flip until you find the item you want to prepare. If you just received ten pounds of eggplants from your CSA, flip to the eggplant pages and you’ll get several ideas. Ok, one more thing. There are also recipes for fruits, poultry, eggs, and meat. So, from the 40 or so pages I marked with sticky notes, I tried the Greek salad with grilled pita crisps first. I’d been thinking about panzanella lately, and this is similar to that or to fattoush. Locally grown, heirloom tomatoes are recommended for this, but what I found at our farmers’ market was just red, ripe lovelies in various sizes. The large tomatoes were cut into wedges, and the cherry tomatoes were cut in half. They were combined with cucumber, onion, and a dressing of olive oil, red wine vinegar, garlic, and fish sauce. I noticed in several recipes for salad dressings, fish sauce is included for a little added umami. Feta was added to the salad, and I used a locally made marinated feta. Last, grilled pita bread was broken into shards and tossed into the mix. The salad was garnished with basil and Greek olives. It was fresh defined and that tip about the fish sauce is one I’ll definitely use again. 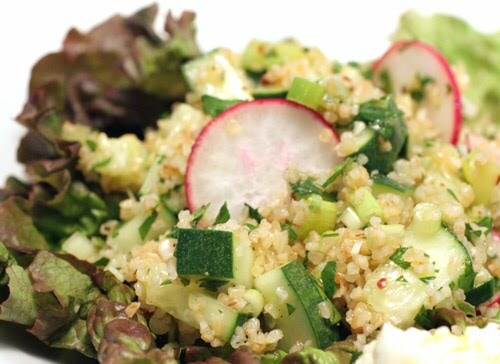 Next, I flipped to the page with the bulgur salad with cucumbers, radishes, and green onions. This is essentially tabbouleh with the addition of radishes, dill, Anaheim chiles, and Aleppo pepper. The dill with the usual parsley and mint boosted the herb effect in the salad, and the radishes added peppery crunch. It’s recommended that this be scooped into lettuce leaves to form wraps which I did. I also used some leftover pita from the Greek salad and spooned the bulgur into pockets. These salads with little, added touches were satisfying dishes making use of several local ingredients. I know this is a book that will spend more time in the kitchen than on the shelf. Mmmhhh, that Greek version of fatoush is wonderful! A perfect summer meal! Hi, lovely salads. I like the tabbouleh wrapped in lettuce, great idea for this warm weather. Thank you for sharing. 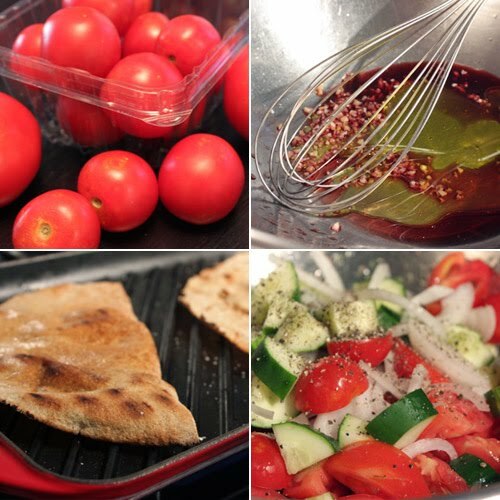 I love how you grill the pita to crisps and adding them to the so refreshing salad. I love those fresh ingredients of radish, tomatoes, cucumbers you added. Both salads are wonderful. Love beet greens and I make a similar bulgur salad quite often. Such a colorful, healthy meal. This is summer eating at its best! Yum! And don't you love cookbooks that so inspire that after one look through they are filled with sticky notes? Wonderful salads, Lisa. I love the tabbouleh salad and also the extra crunch from the pita on your first salad. Panzanella is one of my favorite salads too so I understand why you took inspiration from that great dish. I love a cookbook that's fun to read as well as cook from. Double bonus. This looks like one delicious salad. I love the pitas as croutons! Lisa, this is a beautiful summer salad. 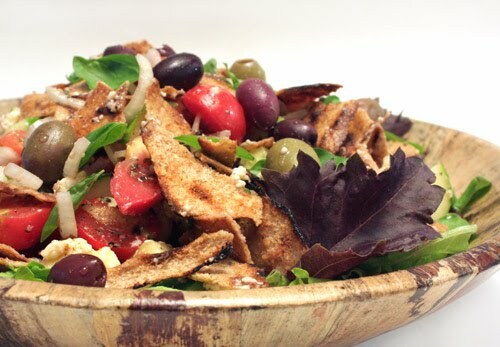 The grilled pita crisps sound really good to go with the salad. i met janet fletcher, the author of 'eating local' yesterday at green gate farms, one of the farms featured in the book. she was lovely and so is the book. i love the idea of the pita chips IN the salad like croutons, and you know how i like my homemade croutons! looks like a perfect summer meal. I love a good Greek salad and the pita chips are a fantastic addition on top. What a lovely salad - all the ingredients really sound perfect together! This salad sounds like it could easily become a favourite of mine using all local ingredienrts right down to the goat cheese. A crunchy greek salad. Is it okay if I have mine with a side of hummas? healthy and yummy looking. love the colours and the crispy pita ... yum! Mmmm, looks lovely a fresh! Next time you guys decide to have a mostly veg week, call me and I will come visit. Seriously, this is the kind of food I could eat all the time - healthy, tasty, interesting. Looks like I am buying that cookbook! Lisa.... in all honesty, I do not need another cookbook. But after reading your post, I am really tempted by this one. Awesome recipe. Lovely and delicious. This sounds wonderful! YUM! :-D And it looks beautiful too! What a lovely summer salad, love your salad bowl too. I love your salad ideas.